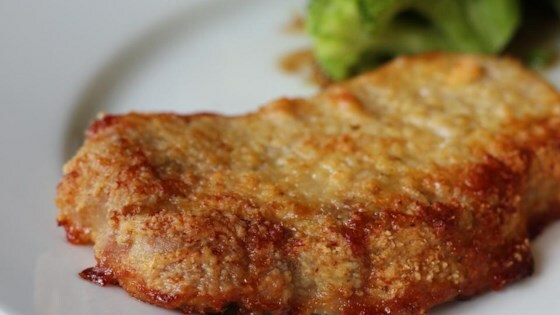 "Pork chops with a delicious Parmesan cheese crust." Preheat oven to 350 degrees F (175 degrees C). Spray a baking dish with cooking spray. Mix Parmesan cheese and Cajun seasoning together on a plate. Dip each pork chop into egg. Press into Parmesan mixture until coated on both sides. Place in the prepared baking dish. Bake in the preheated oven until golden and an instant-read thermometer inserted into the center reads at least 145 degrees F (63 degrees C), 35 to 40 minutes. Made this recipe with a little twist. Added Worcestershire sauce to egg batter and bread crumbs to the Parmesan mixture. Came out amazing! Made as written and no complaints! Simple and straight forward just as pork chops should be! I didn't have Cajun seasoning so I used Old Bay instead, I also added 1/2 tsp of white pepper. Following another suggestion I added Italian bread crumbs. I had to double the recipe for 2 large & thick pork chops. They were tender, tasty and delicious! I've made this recipe several times now. It is always packed full of flavor and very moist - DEELISH!! So easy to make, I made as directed using thick pork chops. They were so tender & juicy. Will definitely make again.